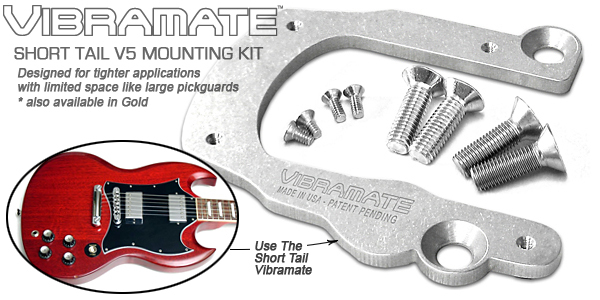 The Vibramate V5 Short Tail Mounting Kit is the same as the Original V5 kit but designed for tighter locations such as the SG Classic style guitars that feature a larger pickguard. 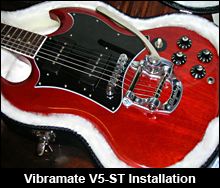 Vibramte V5 is for mounting a Bigsby B5 Original Vibrato and will fit most traditional style guitars that have a tune-a-matic style bridge and a stop-tailpiece. The kit installs in minutes with the included hardware and eliminates the need for drilling permanent holes in your instrument. Vibramate comes with 3 felt-pads secured to the bottom of the mounting plate for a soft touch to the top of your guitar. Vibramate automatically positions the Bigsby Vibrato in the proper orientation and makes a very clean finished appearance with great performance. The Vibramate Quick Mount Kit includes both English and Metric threaded mounting hardware for either US or Import model guitars. Please refer to our online diagram to check mounting dimension requirements for your specific guitar before ordering. Be sure to follow the mounting instructions to prevent damage to your instrument. Now available in Gold and Left-Handed!